Welcome to The Chines! 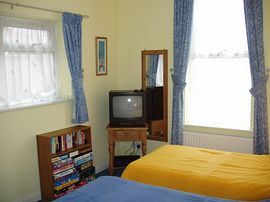 this comfortable apartment is on the ground floor of a Victorian hotel, which was converted and refurbished in 2001. Ideal for exploring the beautiful Isle of Purbeck, it is located just 2 minutes walk from the award-winning, safe, sandy beach in Swanage and minutes away from fantastic walking country, close to Ballard Down. 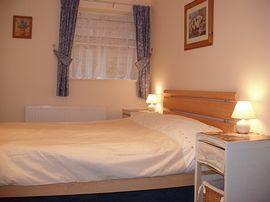 Offering 2 bedrooms and 2 bathrooms, the flat is perfect for both families and couples, well equipped and sleeps 4 people. The master bedroom has a king-sized bed and an en-suite shower room, whilst the other bedroom accommodates 2 3ft beds and TV/video, and is opposite the family bathroom including a bath with shower attachment. 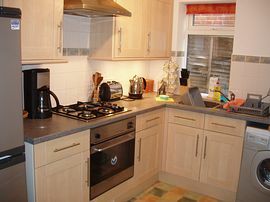 The fully fitted kitchen has a gas hob/electric oven, fridge/freezer, microwave oven and washing machine. 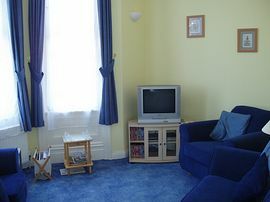 The bright living room, with bay windows, hosts a double sofa bed, armchairs, the dining table and chairs and a TV with DVD and video. 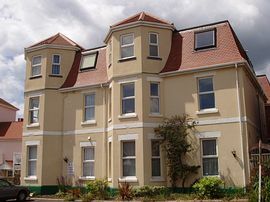 Situated in a quiet residential area, opposite The Grand Hotel with its panoramic views over Swanage Bay, the flat has its own parking space as well as visitor parking at the front of the property. No smoking, no pets, duvets, pillows and bed linin provided, (with regularly laundered protective coverings). Please bring your own towels. Open all year, we offer short breaks out of peak season with a friendly, courteous service when you telephone. Great for walking the South West Coastal Path. Minimum £200.00 in Winter, maximum £670.00 in Summer. Short breaks out of peak season - please enquire.